[Newsmaker] Why did Korean Air heiress illegally hire Filipina domestic workers? It was not an unfamiliar sight when Cho Hyun-ah, the Korean Air heiress whose “rage” over nuts delayed a flight some four years ago, once again bowed and apologized for her “troubles” last month over another set of criminal allegations, this time of illegally hiring domestic helpers from the Philippines. She admitted to the wrongdoing. Given the wealth of the Cho family, one might wonder why Hyun-ah and her mother Lee Myeong-hee sought domestic helpers from overseas, particularly from the Philippines. The case recalls what reportedly used to be a popular yet secret practice among mothers of young children in Seoul‘s affluent district of Gangnam in the early to mid-2010s -- the illegal hiring of live-in domestic workers from the Philippines -- to teach their kids English at home, among others. Unlike other developed nations in Asia, such as Singapore and Hong Kong, hiring foreign-born domestic workers has been an extremely rare practice in South Korea. Under the current law, only marriage migrants (F-6 Visa holders) and foreign-nationals with Korean ethnic heritage (F-4 Visa holders) can legally work in the nation’s domestic and service sectors. These rules were implemented as the country launched its Employment Management Program for ethnic Korean Foreign Workers in 2002. This means that it is illegal for any Filipino-national without Korean heritage to work as a domestic worker in South Korea, unless he or she is married to a South Korean national. Also under the law, any Korean who hires a foreigner without F-6 or F-4 visas as a domestic helper could face up to three-year imprisonment or a fine up to 20 million won ($18,560). Still, according to a 2015 report by the National Human Rights Commission of Korea, it is estimated that there were at least 30,000 to 80,000 foreign-born domestic helpers nationwide in South Korea as of 2014. The study said it is difficult to determine who were illegal. According to the International Labor Organization, there are at least 67 million domestic workers worldwide, most of them women, and nearly all of them from poor or economically disadvantaged backgrounds. The Philippines is one of the world‘s top four countries exporting domestic workers, along with Indonesia, Kenya and Uganda. According to the ILO, an average of 86,000 Filipinos, mostly women, left home for jobs overseas as domestic workers every year from 1992-2015. 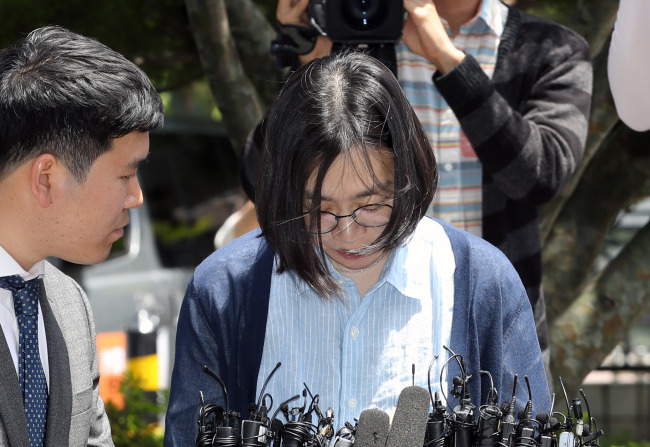 Authorities suspect that Cho and her mother, Lee Myeong-hee, illegally hired some 10 to 20 domestic workers from the Philippines over the course of some 10 years, by disguising them as Korean Air trainees. Lee is also under investigation on the same allegation. According to the authorities, a Korean Air branch office in Manila recruited the workers and then sponsored them with a D-4 visa, a visa for foreign-born job trainees, so that they could stay in Korea for an extended period. The “trainees,” however, were hired as domestic helpers at two properties in Seoul owned by the Cho family, one in Pyeongchang-dong, where Cho’s parents live, and the other in Ichon-dong, where Cho and her children live, authorities said. In South Korea, having a live-in domestic worker -- regardless of the workers being Korean or foreign-born -- is an option only available to certain populations in the country. As of 2015, only 2.5 percent of all Korean households with children aged three or under have had live-in domestic helpers, many of whom are ethnic Koreans from China. Even Legally hired domestic helpers are expensive here. According to Statistics Korea, domestic helpers -- including babysitters -- on average make 1 million won ($928) a month. 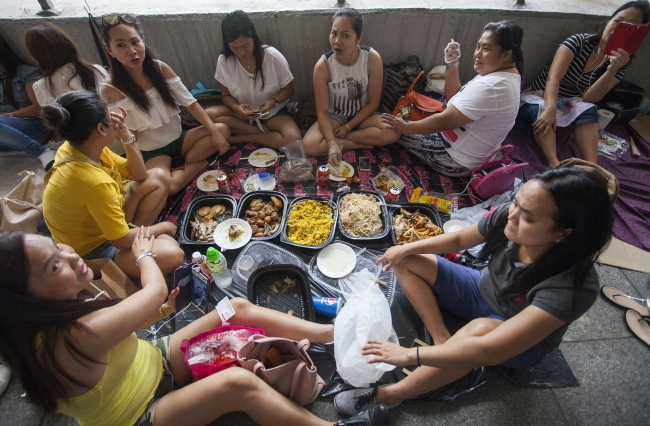 In Hong Kong, where 350,000 foreign domestic workers work and reside, the minimum wage for them is HK$4,410 ($562) a month as of last year. Considering more than 40 percent of all employed South Koreans make less than 2 million won ($1,856) monthly, not everyone in the country can afford to hire such help. For Cho, however, hiring a Korean or ethnic Korean helper would not have been a financial issue. So why did Cho and her mother illegally hire helpers from the Philippines? One of the possible reasons might have to do with privacy. According to the anonymous whistleblower who made the allegation of illegal hiring of domestic help against Cho through an online community site, the Cho family preferred hiring domestic workers from the Philippines, rather than someone from South Korea or any other foreign country. It was because, according to the person, helpers from the Philippines don’t speak or understand Korean, and this made the Cho family feel relatively secure about their privacy inside the house. The person also alleged that the Cho family was verbally abusive and even took away the helpers‘ passports so that they “cannot run away“ after one of them, who went home for vacation, didn‘t return from the Philippines -- reportedly fearing the Cho family’s abusive and allegedly illegal behavior. Another possible reason for the Cho family‘s preference for Filipina domestic help is English. Local broadcaster JTBC recently secured a number of emails exchanged among employees at Korean Air, who reportedly were in charge of recruiting domestic helpers for Lee Myeong-hee in 2014. In one of the emails, a Korean Air employee writes that Lee specifically wanted a domestic helper who is capable of cooking and speaks English fluently for both her residence in Pyeongchang-dong and her daughter Cho’s house in Ichon-dong. It is unclear why English proficiency was important for Lee. But back in 2014, a number of news reports revealed that many Korean mothers in Seoul’s affluent district of Gangnam were unlawfully hiring Filipina women, who are not marriage migrants and do not have ethnic Korean heritage, as live-in nannies or domestic helpers that year. Some of such women were international students from the Philippines. The mothers were doing it, the report said, mainly because workers from the Philippines spoke English and they wanted their children to spend time with an English-speaker at home. South Korea is notorious for its obsession with the English language and English education for schoolchildren. Cho has twins who were born in 2013. The Korea Herald called one of job agencies in southern Seoul, asking about a Filipina domestic worker for a family with a four-year-old daughter in Seoul. The agency said they “no longer” recruit Filipina nannies, and refused to give their reasons. They instead suggested hiring a Korean nanny who speaks English, and said she will probably charge 2 million won ($1,856) a month. The Korea Herald called another employment agency; this one claimed to specialize in introducing foreign-born workers. Asked whether it is possible to hire an English-speaking, Filipina woman as a live-in nanny, the agency said those with visitor‘s visa are the ones who would be most willing to do it, but they would only stay for three months. Of course, it would be illegal. ”You should at least pay them 1.6 million won ($1,484) a month,” the agency said.